My Favorite Romance Plot with a Giveaway! One of my favorite romance novel plots involve the hero who has secretly been in love with the heroine for years. He doesn’t necessarily sit and pine for her, he still lives his life, but under everything is that love for the girl. I don’t really know why that appeals to me, but it always does. When I think back to romance novels that have stuck with me over the years, that it almost always one of the plot points. It’s no wonder that two of my novels utilize that similar plot theme. One is Topaz Heat. 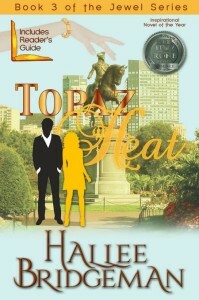 In Topaz Heat, Derrick DiNunzio has been in love with Sarah Thomas since right after his 18th birthday. There is no lost love for him from her, though, and he finally moves to another city to remove himself from her derision. Years later, circumstances bring him back home and he is irritated by the fact that it seems like his feelings for her have never even diminished. My other one is An Aria for Nick. Nick Williams falls in love with Aria Suarez in high school. The difference in this story is that Aria feels the same way for him. But, he is from the wrong side of the tracks and feels like she’s too good for him. Despite the depth of his feelings for her, when an opportunity to disappear and work in black ops presents itself, he feels that “dying” is the ultimate sacrifice for her. Ten years later, Aria’s life is endangered, and Nick is the only one who can save her. He has to come back from the dead and face his feelings for her in order to save her. If I look back at my own books and need to pick favorites, these two always stand out. What is your favorite type of romance novel plot? Does a similar theme always stand out to you? One commenter will receive an autographed copy of Topaz Heat and one commenter will receive an autographed copy of An Aria for Nick. I like this style plot too. An Aria for Nick has a twist to it, with Nick disappearing and being thought dead. Both sound great! Ah Nick! Aria for Nick is still my favorite book of yours. Thanks for sharing today. Marriage of convenience stories can be fun to write. This plot is always a winner. Aria for Nick soes sound intriguing! Thanx for the giveaway!!!!! I am looking forward to reading Aria for Nick since I have read Carol for Kent. This time I want to read them in order just because. Anyway, I like it when the man character has always had feelings for the female character but does not want say anything to mess up a good friendship. I also like it when the two character can not correctly interrupt each others true feelings and always guessing wrong. That is truly a challenge. I know I am going to like your books so I am always thankful when I am able to purchase each one of a series. Kept up the wonderful stories. Thank you so much for your reply! I’m glad you enjoyed A Carol for Kent. It is one of my favorites. I too loved An Aria for Nick. That’s been my favorite of yours as well. I loved that they both carried a torch for each other since high school. I’m juggling two stories right now. One is instant antagonism but having to work together (their best friends are getting married, he’s best man, she’s maid of honour). The other is old friends who both have romantic feelings for each other but something always gets in the way of them being together. Both are fun but have a lot of potential to explore too. I too like the pining Heroine and Hero plot lines. I don’t know why I’ve never written it. I’ll have to give it some thought. And I love all your books Hallee. One of my favorite plots for romance is friends to romantic interest. It think it’s my favorite in real life, too. I find myself always encouraging my daughter to be friends first. I really love the entire Jewel series! I love how the characters continue through each story and by the end of the last book they feel like friends! My favorite plot, although it works a lot better in historicals, is the marriage of convenience where the couple is married in name only but fall in love through the course of events. My favorite “Hallee book” is A Melody for James but I have not read An Aria for Nick. Looking forward to it! Any book with Hallee’s name on it is fabulous! I love all your books, but An Aria for Nick holds a special place in my heart. I do love Romantic Suspense and would have to say it my favorite.